This post came as a result of questions in a lecture I gave this morning on Effective use of ScotlandsPeople Website at the Federation of Genealogical Societies Annual Conference in Ft. Wayne Indiana. 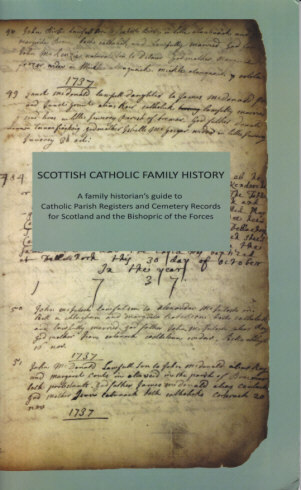 Scottish Catholic Family History: A Family Historian’s Guide to Catholic Parish Registers and Cemetery Records for Scotland and the Bishopric of the Forces. By Andrew R. Nicholl. Published by The Aquhorties Press, Columba House, 16 Drummond Place, Edinburgh EH3 6PL, UK. www.scottishcatholicarchives.org.uk. 2011. 115 pp. Illustrations. Softcover. £10. The Catholic Parish Registers Project began with a focused plan – to digitize and index all pre-1855 Catholic parish registers that existed. Digitization continued beyond this date because volumes continued beyond 1855, post-1855 registers had been deposited at the Scottish Catholic Archives; plus the records of the Bishopric of the Forces, Dalbeth Cemetery in Glasgow and Mount Vernon Cemetery in Edinburgh were fully available. If the records survive in the Scottish Catholic Archives they have been digitized, though there may be more modern records still in the Catholic parishes around Scotland. The latter have not been sought after to be added to the collection at this stage. This collection is much more extensive that the photocopy collection of Catholic registers that exists at the National Records Scotland (former National Archives of Scotalnd). In the collection there are the usual parish registers of births/baptisms, marriages and deaths/burials/funerals, each with 100, 75 and 50 years closure periods respectively to protect privacy. Other items in the collection, all with a 100 year closure, include: confirmations; confessions; converts; communicants; status animarum (“state of souls” – often a list); seat rents; and sick call. The book begins by describing all the different record classes, itemizing what they are likely to contain and showing an example. The largest section of the book is the detailed lists of the records. The lists are arranged by location of the parish and the saint to which it is dedicated. For each location it identifies the type of register, dates covered and the collection reference at the Scottish Catholic Archives. There is the Missions and Parishes Collection, plus the Individual Missions Collection and the researcher needs to check both lists for complete coverage of any given locality. For the three major Catholic cemeteries in Glasgow and Edinburgh that are included there are internment registers, owners’ registers and lair registers, all of which can provide different information. The Bishopric of the Forces records are the Catholic records from the British military all over the world, unfortunately many of these still fall under the time closure rules. The last section in the book is a directory, with maps, of Catholic parishes in Scotland. The directory in table format provides: name of the town and dedication of the church; the unitary authority; diocese; date the mission was founded; date of the church building. For most researchers, unfamiliar with Scottish geography, it is the maps locating the churches that will help us identify the parish records worth investigating for our ancestors. One additional aid included is a comprehensive Latin-England forename glossary with all case endings making it easy to distinguish the Latin variants for Patrick and Patricia or Terence and Teresa or other similar male and female names. If you have searched ScotlandsPeople and found your Catholic ancestors you are fortunate. The bigger problem is if you have searched and not found them – is it because they are not there, the records have not survived, or you are just looking under the wrong name. It is this book that will help you identify the time or record gaps in any specific parish. This book is therefore very important for anyone working on Scottish Catholic ancestry. I am in the process of updating a lecture on Irish Maps to be given at the 2013 Federation of Genealogical Societies Conference in Ft. Wayne, Indiana. This process reminded me of what is probably my favorite book about maps and I thought readers may also want to know about it. This book opens with the quote: “Maps are graphic representations that facilitate a spatial understanding of things, concepts, conditions, processes or events in the human world” (p.15). 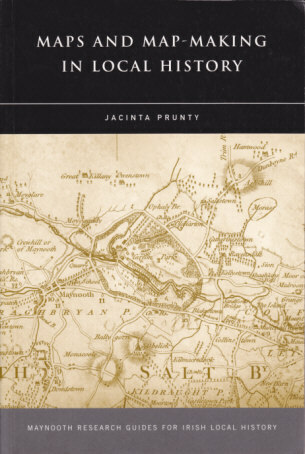 The rest of the book expands upon that theme, successfully introducing the reader to the use of maps in research, writing and presenting local history. The illustrations are all from Ireland, so it is especially valuable for those researching in Ireland, but the concepts and ideas introduced are applicable for anyone working with maps. In fact two of the appendices are worth the price of the book alone, simply because they do apply to any location — “Questions to be asked of maps” and “Questions to ask of your place in the search for maps”. This is essentially a practical guide, including notes on the map series that are immediately useful for local history, and thus family history in Ireland, plus information on the major repositories, catalogs and finding aids, ways to use the maps in research, and the ways the maps themselves were made. Maps provide the context in which family historians place families within a community. In local history, researchers examine how that community operated in relationship to its neighbors, what resources were shared, how the interactions and development was affected by the landscape, all of which can be seen with maps. The book is divided into four sections. The first, and largest, provides a historical overview of map-making in Ireland. The watershed here is the six-inch to one mile Ordnance Survey maps. Their production, content and legal standing are described in detail. The maps created before and after this significant series are also thoroughly described. This section is well illustrated and provides researchers with a glimpse of what is available. The author suggests, in the process, that the researcher should obtain any and all maps for the relevant geographic area, regardless of the time period or the maps focus (e.g. railways, canals, roads, military, plantation, geology, antiquities, estates, or bogs). A very practical chapter on map-reading skills discusses scales, projections, orientations, national grid, grid references, sheet numbering, height, contours, boundaries, measurements, dates, and symbols. Ms. Punty explains where to locate maps, how to get started, and how to use guides to local and major archives or library collections, some of which are online. The book concludes with some case studies on how maps can be used by historians, local and family. This last section of the book also addresses the issues of copyright ownership, and provides guidelines for making your own maps, with or without computers. Many references to published and online materials provide further guidance throughout the text for researchers wanting to explore Irish maps and map-making further. There is no doubt that this will become the standard guide for anyone working with Irish maps. It is highly recommended for personal and society collections.